3. There are two theories to arguing with a woman. Neither works. Third ~ Some people try to turn back their odometers. Not me; I want people to know 'why' I look this way. Seventh ~ One of the many things no one tells you about aging is that it's such a nice change from being young. And, finally ~ If you don't learn to laugh at trouble, you won't have anything to laugh at when you're old. 3. Keep learning. Learn more about the computer, crafts, gardening, whatever. Never let the brain idle. " An idle mind is the devil's workshop." And the devil's name is Alzheimer's. As a wise philosopher once said, you can only look as good as you feel. Focus on health, fitness and peace of mind to create a radiant impression at your reunion. 1. Get plenty of rest and exercise prior to the reunion. In addition to feeling less stressed, you will look more refreshed and vibrant. 2. Choose clothes that are youthful but age-appropriate. Wear your most flattering colors and styles. 3. Wait until a few days before the event to color hair, get a manicure or get a pedicure. Because of inevitable post-facial breakouts, have a facial approximately two weeks prior to the reunion. 4. Practice walking and talking with confidence. Take time to meditate and to imagine yourself as the perfected version of the person that you were in school. Confidence begets attractiveness in everyone. 5. Drink lots of water. Water not only hydrates the skin, but also keeps it looking plump and radiant. 6. Invite your husband, wife or significant other to join you at the reunion. A person in love always looks good! Tip? Forget about trying to fit into that high school prom dress, or your favorite college outfit. Concentrate on feeling comfortable and confident in an outfit that suits you now. It's normal to experience the class reunion jitters. Don't let your insecurities force you to miss what could be the time of your life. 1. Take an afternoon or evening to jot down all of your positive school memories, look over photos of old friends and listen to music from your school years. 2. Make a mental list of all that you have accomplished and how you have grown through the years. 3. Get in touch with at least two former classmates. 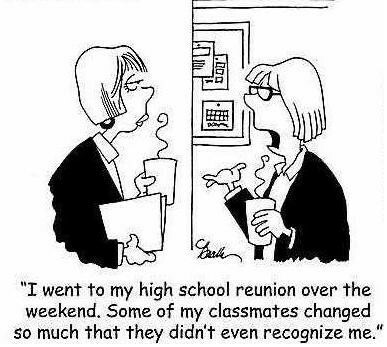 Reminiscing with old pals will help you to get in the reunion spirit. 4. Ask to help with the reunion planning. There's always room for one more planning committee member, and it will help awaken your enthusiasm for the event. 5. Arrive in your hometown one day early if you don't live there. Spend quality time visiting your favorite spots, driving around your old neighborhood and dwelling on nostalgia. 6. Look your best. Rather than crash dieting, stepping up your health and fitness program several months prior to the reunion will ensure that you look and feel your best. Tips? Remember that everyone had the same insecurities and issues that you did in school. Approach the reunion as an opportunity for reconciliation, understanding and fun! Take a hot bath and a long stroll the day before the reunion to unwind and reevaluate your nervousness. transformation through life. Make a point of attending and you won't be disappointed. 1. Keep in touch with the alumni center and/or reunion committee at your former school via regular address updates. Even if you do not receive update requests, make a point of sending one each time your contact information changes. 2. Start a reunion savings fund. Most likely, attending your reunion will require travel and accommodation expenses, in addition to fees for the reunion itself. Planning and saving ahead of time will make the cost as painless as possible. 3. Reserve time off from work well in advance to ensure that you are covered for any travel time. Although most reunions occur during the weekend, you may need an extra day for travel. 4. Ask the reunion committee about hotel room blocks. You may be able to take advantage of reunion discounts if you stay at the group hotel. 5. Make airline reservations well in advance to ensure the best possible rate. Tip? Get yourself in the reunion spirit by browsing through old photo albums, school yearbooks and videos. After several years, you can easily go blank when faced with a roomful of former classmates. Relax, focus and use these memory techniques for guaranteed success. 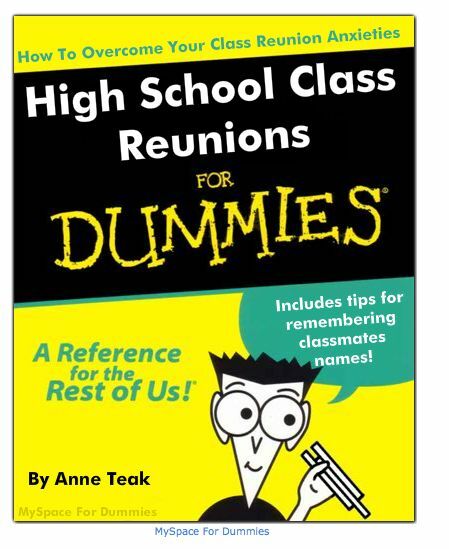 1. Review your senior yearbook prior to the reunion to brush up on long-forgotten faces and names. 2. Use mnemonic devices to remember names. For instance, saying "Patty Devry has bright green eyes" will ensure that you remember Patty's name the next time you run into her. 3. Repeat each person's name right after being introduced. Saying someone's name out loud shows them that you are listening, and helps to solidify the name in your memory. 4. Make a point of introducing the new person to your significant other, or to another friend, immediately after initial contact. 5. Make a list of people as you meet them, with an identifying characteristic following the name. If necessary, refer to this list before you approach anyone that you have already met. Tips? When being introduced, relax and listen carefully. Many people tense up and become distracted as they anticipate introducing themselves. Always be certain that you know a person's name before you address them. You'll not soon forget the embarrassment of calling a new acquaintance by the wrong name.